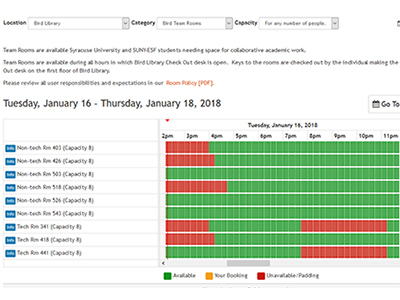 Syracuse University and SUNY ESF-affiliated students can now book study rooms in Bird and Carnegie libraries through an online reservation system, available on the web 24/7 at goo.gl/3h9yN6. The new self-service system shows real-time room availability and can be used for immediate bookings or for future dates and times. Room bookings are confirmed via email. Those with confirmed bookings and a current SU or ESF I.D. can sign out room keys from the first floor check-out desk in Bird Library and the second floor information desk in Carnegie. For more information on student study rooms in the libraries, visit library.syr.edu/locations/student-study-rooms.php.